So, my life lately. It has been good. Very good! Once Sticker left our house, we welcomed Jake (from State Farm… ha) one day later. He stayed with us for a little over a week, and was such a delightful dog to have around. I don’t know if anyone reading this has a golden retriever, but I have noticed that every golden retriever I’ve met has what I like to call “Elvis arms.” By Elvis arms, I mean that their arms have fur that looks like leather fringe jackets that Elvis used to wear. Okay, I’ll stop with my weird thoughts. As for working on my goals for 2015, I have been taking care of my nails, meal planning, decorating, and reading. Woo hoo! Things I am reading: the Chronological Bible with Jimmy, The Remedy for Love (meh, don’t recommend), and #2 on this list. I just started getting into audio books. Life changed. Dramatic? Yes. On the meal planning front, I have made slow cooker chicken tortilla soup, chickpea soup, homemade pizza, and chicken tikka masala. 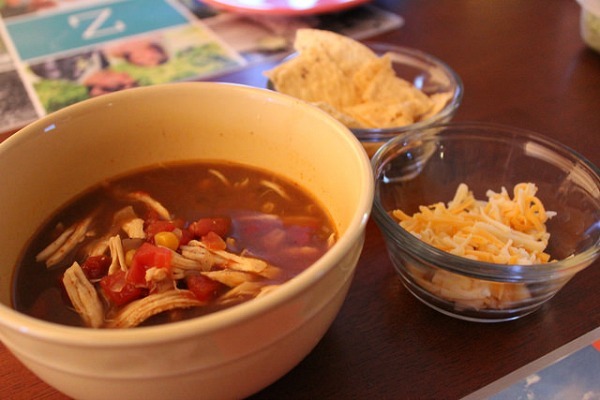 The chicken tortilla soup is pictured below. Gotta love slow cooker meals! I mentioned that I had a cold around New Years, and the stuffiness never went away. It got to the point where my teeth hurt, because apparently swollen sinuses push on the nerves to your upper teeth. Ouch. So, I went to Med Express and got some prescriptions last night. I don’t like taking medicine (I’ve had some bad experiences), but I realize that I am incredibly blessed to live in a country where I have access to medicine and health care and so much more. Even when I’m sick, I am beyond blessed. 1. Where is the #1 dream place you want to travel to? 2. What are you looking forward to most in 2015? I’ve never thought about Elvis arms on dogs but that’s interesting. Thanks for enlightening me! I hope you feel better soon, I too have had sinus issues that made my teeth hurt and that’s one of the worst things ever. Hopefully the medicine will work and you can have a speedy recovery. 1. I want to see the tulips in Amsterdam! 2. I should get to check #1 off the list in April of 2015 – yay! That sunrise picture is beautiful. My teeth are chattering just thinking about the temps though. That is so funny that you grilled out when it was 30 degrees and balmy! Haha! I hope you get to feeling 100% better soon! OH MY GOODNESS YAY! That is so, so exciting!! I have heard and read wonderful things about Amsterdam! And yes 30* = balmy fo sho! It’s going to be 40* here on Saturday and I can’t wait! I’m seriously giddy, haha! Italy! Congrats on the job! Such a good choice! Italy sounds amazing.. pizza, pasta, gelato… can’t go wrong with all of that goodness, not to mention all the sights and just culture in general! The Elvis arms–hilarious! 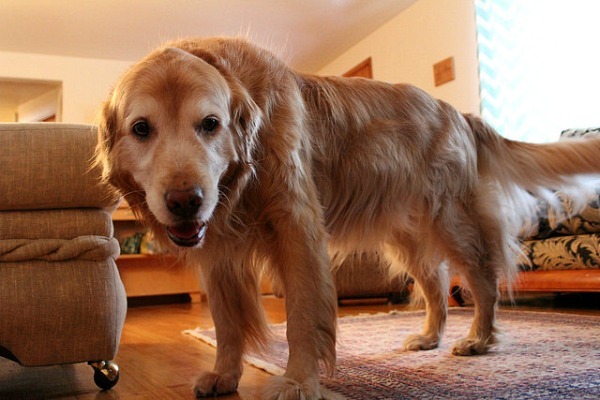 I’m considering getting a golden this year, so seeing the picture of beautiful Jake made me go AWWWWW! And living in Cleveland, I understand the temps you’re experiencing. It’s 27 degrees right now and I was just thinking that it feels pretty warm! Relatively, that is. Aww, I hope you do get a golden this year! Jake was honestly, hands-down the best dog I have ever pet sat. Ever. He was actually better behaved than my dog, LOL. I hope you’re staying warm in Cleveland!! 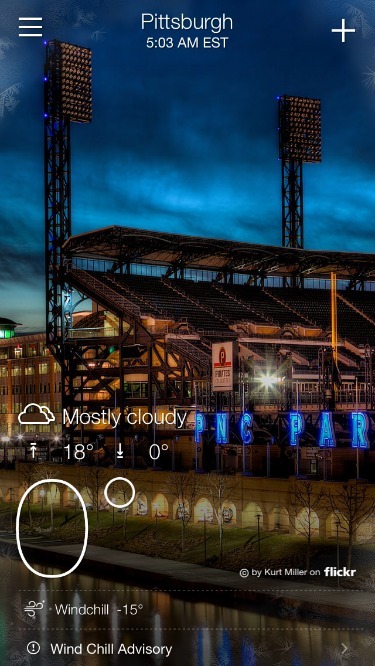 It’s supposed to his 40* here in the Burgh’ with weekend… can’t wait! AHH I think that’s my goal for 2015 too, but I’m scared!! Amen!! I would totally go with you! Bahahaha at the Elvis arms. I would LOVE TO TRAVEL TO Ireland. I’ve been dying to go for a while now. They were out of control and I had to brush them every day, which made me giggle even more! And Ireland!! Every time I see pictures of Ireland, I’m always in awe of how GREEN it is there. Gorgeous!! Ha, Elvis Arms!!!! Never saw it that way before, but it’s so true! They were just too cute not to photograph! Thank you! It is very exciting! I really, really love it so far! HAHA love the Elvis arms. 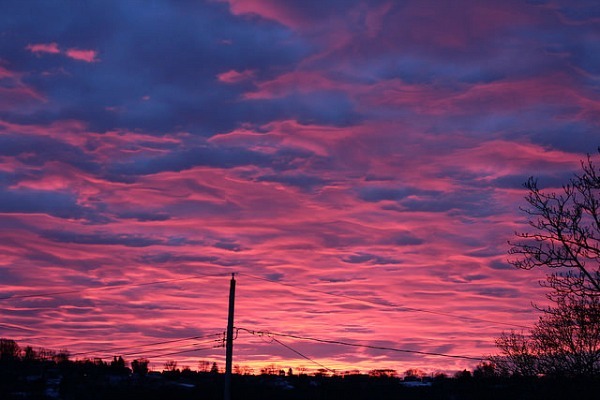 Beautiful sunrise!! Hope you are feeling all better! Me too!! They’re just so fuzzy and adorable! And thank you, I am finally feeling a bit better! Hooray for being employed. I look forward to hearing more about that. Ah! I love using the slow cooker! I make so many delicious things in that magic machine! I agree, 30 degrees in Pittsburgh is a heat wave and good enough for me to wear shorts to crossfit and for you to cook on the grill! Me too! It really is like magic! I just love how easy it is to use! And duuude, I can’t wait for 40* weather this weekend! Yahoo!!! 30 degrees in Pittsburgh is definitely a heat wave! You know it’s bad when we can say anything about 30 is warm! Isn’t it crazy to think about?! Haha!